1989 is a year most renowned by DC Comics as the debut of Tim Burton’s Batman, but theaters did see the release of another DC property that year: The Return of Swamp Thing. It was the latecoming, low-budget sequel to 1982’s Swamp Thing. The movie produced enough interest for the USA network to pick up a live action television series based on the character for three seasons. 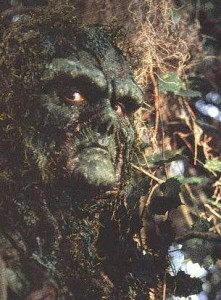 20 years later, all 21 episodes in the First Season of 1990’s Swamp Thing are available to viewers courtesy of Hulu. Although critically panned, the Swamp Thing series has seen a dedicated cult following for its value both to long-time Swampy fans and general unintentional-camp-genre aficionados. Because of this, the program has seen heavy rotation in the past couple of decades on (what was then) the SciFi Network. Not enough Swampy for you? Well, grab some popcorn because Hulu also offers The Return of Swamp Thing, the film which inspired the entire series. So, why all the renewed interest in a series older than the boy band phenomenon? Maybe because the original film is being remade in 3D by Vincenzo Natali (director of 1997’s Cube). How will Swampy fare in the post Spider-Man era of comic book films? Only time will tell, but until then feel free to indulge yourself in the cinematic history of Alec Holland! Visit Uncle Gorby’s Corner in the Forum! Thanks for the meal!! But yeah, thanx for spending some time to talk about this topic here on your internet site.